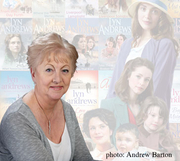 Lyn Andrews is one of the UK's top one hundred best-selling authors, reaching No. 1 on the Sunday Times paperback bestseller list. Born and brought up in Liverpool, she is the daughter of a policeman who also married a policeman. After becoming the mother of triplets, she took some time off from her writing whilst she raised her children. Shortlisted for the Romantic Novelists' Association Award in 1993, she has now written twenty-six hugely successful novels. Lyn Andrews divides her time between Merseyside and Ireland. Lyn Andrews is currently considered a "single author." If one or more works are by a distinct, homonymous authors, go ahead and split the author. Lyn Andrews is composed of 3 names. You can examine and separate out names.